This review has been printed in the December 2018 issue of Chess Life. A penultimate (and unedited) version of the review is reproduced here. Minor differences exist between this and the printed version. My thanks to the good folks at Chess Life for allowing me to do so. Alekhine, Alexander. Chess Duels 1893-1920: 260 Games Annotated by Alexander Alekhine. Prague: Moravian Chess, 2017. ISBN 978-8071890126. HB 452pp. Donaldson, John, and Nikolay Minev. The Life & Games of Akiva Rubinstein, Volume 1: The Uncrowned King. 2nd edition. Milford: Russell Enterprises, 2018 (2006). ISBN 978-1941270882. PB 402pp. Dvoretsky, Mark. Chess Lessons: Solving Problems & Avoiding Mistakes. Milford: Russell Enterprises, 2018. ISBN 978-1941270707. PB 274pp. Llada, David. The Thinkers. Glasgow: Quality Chess, 2018. ISBN 978-1784830335. HB 208pp. Ris, Robert. Crucial Chess Skills for the Club Player, Volume 1. Gent: Thinkers Publishing, 2018. ISBN 978-9492510228. PB 239pp. Chess players are an ecumenical lot. While we all worship at the altar of Caïssa, the goddess of chess first described by the Renaissance poet Hieronymous Vida in 1527, many of us also prostrate before other deities. With the holidays fast approaching, let me be the first to wish you a joyous season, however you may choose to celebrate it. It’s a good thing that we chess players are so open minded, since the only thing better than getting chess-related gifts this time of year is giving them! This month I want to look back at the year in books, picking out a few worthy titles that didn’t make their way into my column. (My favorites among those reviewed in the past year, for what it’s worth, are Timman’s Titans by Timman and Applying Logic in Chess by Kislik.) Perhaps you’ll find a gift idea for a chess friend here, or you can circle a title and leave this issue open somewhere for a loved one to find. We’ll begin with a rare beast in the world of chess publishing, the coffee-table book. And not just one, but two! David Llada’s The Thinkers is a sumptuous collection of more than 170 photographs of players from around the world. His subjects range from World Champions to street hustlers, but the real focus of the work is the game itself, the struggle and the agon. Anyone who loves our game will see themselves in this book, and non-initiates will come away with something of what it means to play it. Llada includes a few mandatory shots: an intense, glaring Kasparov, a gaunt and haunted Grischuk, an Ivanchuk fully absorbed in the position in front of him. For me, however, it’s the photos of the lesser known personalities, many taken at Olympiads and the ill-fated Millionaire Chess, that are most evocative. We encounter in Llada’s portraits a chess world that is far more globalized and diverse than we might expect, and through his lens, perhaps we chess players might better understand our community and ourselves. Brilliant, brilliant stuff. The Thinkers is a quintessential coffee-table book. Despite its heft and lavish production, I would argue that The Sinquefield Cup: Celebrating Five Years: 2013-2017 is not a coffee-table book, not precisely. It is that, of course, with its dozens of documentary photographs and stunning layout. But more to the point, The Sinquefield Cup is a fitting documentary tribute to a tournament and a patron that together have fundamentally reshaped American chess. This eponymous book tells the story of the origins of the Sinquefield Cup. Rex Sinquefield explains how he had to be talked into lending his name to the tournament, and Sunil Weeramantry describes his early diplomatic efforts on behalf of the Saint Louis Chess Club. STLCC broadcasters Yasser Seirawan (2013), Jennifer Shahade (2014), Alejandro Ramirez (2015), Tatev Abrahamyan (2016), and Maurice Ashley (2017) report on each of the tournament’s first five years, including in-depth analysis and notes on key positions. An appendix contains player bios, crosstables and complete sets of games for each tournament. The Sinquefield Cup is a well-crafted homage to the elite chess on display in the Sinquefield Cup, and a worthy testament to the great work done by Sinquefield and the Saint Louis Chess Club. This is a book that deserves to be read by all fans of American chess. Perhaps its only drawback is its size – you need a very big coffee-table to lay this book flat alongside a set and board! Games collections always make good gifts for chess players, and more than a few notable titles have made their way to me in the past year. One of the most interesting is Chess Duels 1893-1920: 260 Games Annotated by Alexander Alekhine, out last year from the Czech publisher Moravian Chess. The book is, as one would expect from its title, a collection of games annotated by the 4th World Champion. Chess Duels uses multiple sources for Alekhine’s annotations, including newspapers and chess journals in Russian and French. Many are from his own praxis, while more than a few are by other, lesser known players. And that’s where the exceptional value of this book lies. 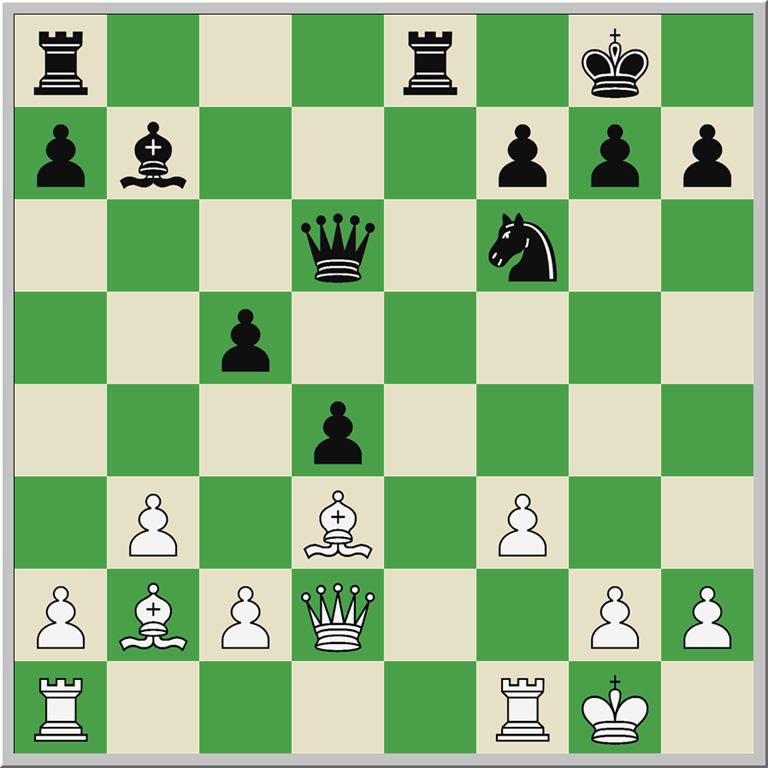 A good number of the games in Chess Duels can be found elsewhere, most notably in Alekhine’s own My Best Games 1908-1920. There are also dozens of gems played by half-forgotten masters of the past, many of which do not appear in MegaBase or other standard sources. Here is one such game from the ill-fated Mannheim 1914 tournament, contested right as the first shots of World War I rang out. It features the noted Russian player and theoretician Peter Romanovsky in a wonderful tactical display. 20.Qd1? Rxg2+ 21.Kh1 Qh6 and Black is winning. Romanovsky recommended 22.Kh1 but Alekhine writes that after 22. …d2 White will have trouble defending against …Qe3 and …Re1. Modern engines show us that Romanovsky was probably right, with the amazing line (per Fiala) 23.Be4 Qe3 24.Bd3 Re1 25.Bc3 Rc1 and neither side can make any progress! Better is 22. …Rxc2. If 25.Bxd2 Rxd2 (25. …Qxd2 26.Rad1 c3? 27.f4!) 26.bxc4 Rxc2 27.Bd5 (27.Rae1 Re2) 27. …Qd2 28.f4 Rxa2 and Black is better. 26. …Qh5 is mate in eight. This year also saw the second printing of a games collection that had become very hard to find. The Life & Games of Akiva Rubinstein, Volume 1: Uncrowned King is the definitive treatment of the most important years (1882-1920) of Rubinstein’s legendary career, but due to scarcity or the vagaries of unseen algorithms, it was only available on the Internet at exorbitant prices. Now, with this re-release, readers can once again enjoy the 492 Rubinstein games included in the book, many with notes collected by the editors John Donaldson and Nikolay Minev. Rubinstein is often cited as a player whose study will improve one’s chess, and Boris Gelfand has repeatedly discussed the value of playing through his games. This new printing is great news for all chess fans, save those collectors who had hoped to fund their retirements through the sale of the first edition! Improvement books are always welcome gifts, at least in the Hartmann house, and Robert Ris’ Crucial Chess Skills for the Club Player: Volume 1 was one of the year’s best. Ris does an excellent job of focusing on three areas where most sub-2200 players might improve: endgames (chapters 1-4), tactics (chapters 5-6), and middlegame strategy (chapters 7-9). The three chapters on rook endgames are especially good. Readers are not burdened with extensive analysis in Crucial Chess Skills. Instead they are treated to an appropriate and instructive mix of words and moves. Readers should also be aware, however, that much of the material in Crucial Chess Skills is recycled from his columns for the defunct ChessVibes Magazine – all the endgame examples, save one, are found there – and from his various video products. There’s nothing wrong with this practice, but if you have other Ris titles on your shelf, you might want to ask Santa for something different. Our final title this month, Mark Dvoretsky’s Chess Lessons: Solving Problems & Avoiding Mistakes, is a sequel of sorts to Dvoretsky’s Analytical Manual, sharing much of its DNA. The analysis is intense, and Dvoretsky holds nothing back in his presentation, turning the firehose on full blast. But the real goal of Chess Lessons, as was the case with Dvoretsky’s Analytical Manual, is education. All of the analysis works to illustrate how the best players think about chess and also about their thought processes. Take the discussion of the game Oll-Hodgson (Groningen, 1993). The notes stretch on for ten pages (68-78), but there is method to Dvoretsky’s apparent madness, with helpful asides on candidate moves, opening analysis after Carlsen, and the principle of the worst piece working as signposts to lead us through the analytical thickets. Dvoretsky’s study of Fine-Shainswit (US Championship, 1944) is excellent in its discussion (112-118) of the psychology of sacrifice, and his use of the position after Black’s 28th move in training games with his students helps us understand how different players can approach the same problem to be solved. Chess Lessons is not for the faint of heart, and it’s probably best suited for experts and above who don’t mind a little hard work. I’m an A player, and while I struggled to stay afloat in the depths of Dvoretsky’s analysis, I do feel as if I learned something in the process. (Whether this is real or epiphenomenal, only time will tell.) My only complaint about the book is its size. There is so much text crammed into its 6×9 inch pages that it can be hard to read, and I suspect that making it oversized like Dvoretsky’s Analytical Manual would have made the layout much clearer. This entry was posted in buying guide, Game Collections, history and tagged Akiva Rubinstein, Alekhine, David Llada, Dvoretsky, John Donaldson, Mark Dvoretsky, Robert Ris, Sinquefield Cup book on November 20, 2018 by fullcityplus.